Hadley is an unincorporated community in Mercer County, Pennsylvania, United States. The community is located along Pennsylvania Route 358 12.9 miles (20.8 km) north of Mercer. Hadley has a post office with ZIP code 16130. David Hadley came to Perry Township in 1843. He was a shoemaker by trade, but with his family took such an active part in clearing his lands and building mills that when the Lake Shore Railroad was built across the township and a station erected on land donated by him, the locality was given the name of Hadley in deserving honor of his worthy life and character. Hadley post office was established in May, 1868, with David Pattison as postmaster, and several years later the town was platted. A barrel factory was the important early industry, established in 1868. Hadley Presbyterian Church was organized in 1875, and its building dedicated the following year. A Methodist church was organized in 1882 and their building erected in 1884. ^ a b "Hadley". Geographic Names Information System. United States Geological Survey. 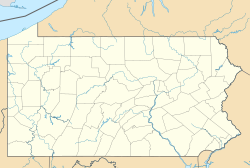 This Mercer County, Pennsylvania state location article is a stub. You can help Wikipedia by expanding it. This page was last edited on 26 November 2018, at 05:53 (UTC).